TOKYO, Japan, September 26, 2011 – Seiko Epson Corporation ("Epson," TSE: 6724) today announced it would on October 1 begin sales of the IP-2000, a semiconductor marking system that utilizes the inkjet method to print identification data, such as the manufacturer's name or a production number, on the surface of a semiconductor package. A key merit of this system lies in its ability to print more speedily and clearly than the conventional method of engraving by means of laser cutting, while protecting the IC chip inside the semiconductor package. 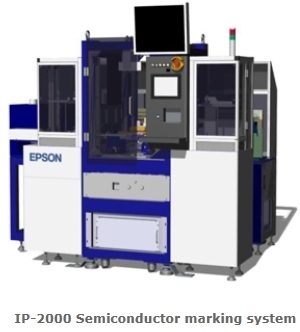 "We developed this product in response to growing demands among semiconductor manufacturers for small lot production," said Hideo Hirao, responsible for Epson's Factory Automation Division. "With a need to make electronic components - and therefore semiconductor packages - smaller and thinner, conventional marking methods have a higher risk of affecting the IC chip inside the package. By using Epson's inkjet technology, our new product is suitable for small lot production, while also protecting the IC chip." Making use of Epson's proprietary Micro Piezo technology, the IP-2000 prints directly onto semiconductor packages by applying high-visibility white UV (ultraviolet) cured ink, also developed by Epson. As this method does not require engraving on the package, there is no danger of cutting into the IC chip inside the semiconductor package. In addition, the new system does not require the printing plates required with the conventional pad method, meaning that the IP-2000 can easily be utilized in small lot manufacturing for a wide variety of products. The IP-2000 strengthens the adhesion between the ink* and the package surface by performing a cleaning action prior to applying the ink. Ultraviolet irradiation is undertaken simultaneously with printing with the purpose of solidifying the ink. In this way, the IP-2000 provides an integrated semiconductor package marking process, enabling customers to seamlessly introduce it into their operations. Based on Micro Piezo and other core technologies, Epson's SE15 long-range corporate vision positions the industrial and commercial sectors as key business domains for future growth. Epson will continue to reinforce these efforts going forward to provide products and services that exceed the expectations of customers worldwide.